The fine, soft, light, brownish-red non-sticky powder consists of the sieved glands and tufted hair of the fruits of the Mallotus philippinensis, a tree-like member of the Euphorbiaceae family. It has a sprinkling of grey-yellow particles, is tasteless and without odour and is insoluble in water. When the powder is treated with alcohol, ethyl ether, chloroform or a potassium or sodium hydroxide solution, a reddish yellow dyestuff is released (rottlerin, as well as some other dyestuffs of the phloroglucin type). Kamala consists up to ca. 80% of resin. Besides homorottlerin and the dyestuffs mentioned above, kamala includes citric acid, tannic acid, rubber, sugar and wax. 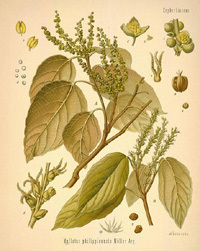 The seeds of the plant yield the fatty kamala or camul oil, containing highly unsaturated kamlolenic acid. Rottlerin, also known as mallotoxin, is the most important and also the most poisonous constituent of kamala. The pure dyestuff is crystalline, pale yellow to salmon-coloured and has a melting point of 205 to 207 degrees Celsius. It is insoluble in water, but dissolves in organic solvents. In internal medicine kamala was first recommended by English doctors practising in India as a remedy against tapeworm, mainly in view of its quite drastic laxative effects. Following clinical testing, it has since become part of the German pharmaceutical repertoire.